Bermuda is such an overlooked destination. From Boston, it is only a short hour and a half flight. My husband and I took a mid-morning flight and were sitting on a beach, cold drink in hand by noon. It is safe, clean and you can drink the water without a worry. The only down side is that it is expensive. Wander around this historic area with it’s cobblestone streets and narrow alleyways. Climb the stairs to the large cedar doors of St. Peter’s Church. The interior is small yet the exposed wooden beams make you feel as if you are on a ship. The graveyard is a reminder of Bermuda’s segregated past. 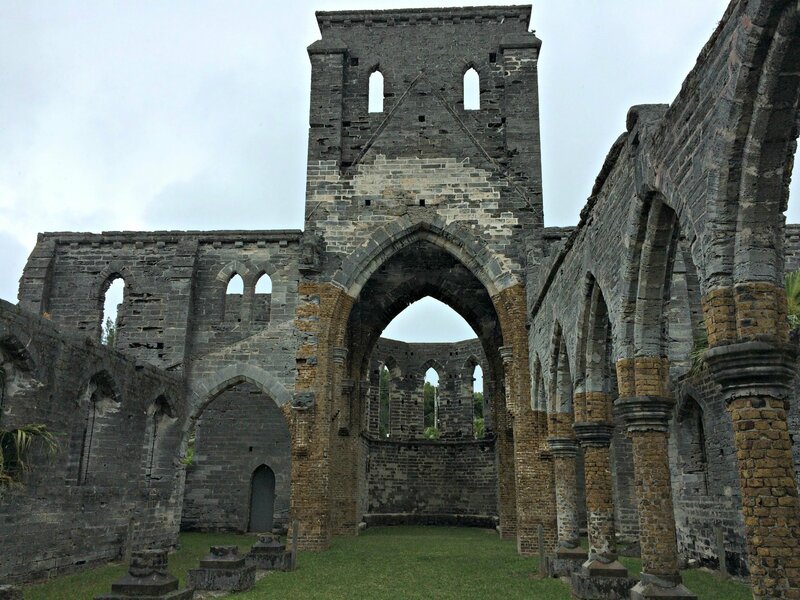 Just a five minute walk from St. Peters, you can see the Gothic ruins of the Unfinished Church. The grand archways give way to a grass floor and sky ceiling. Follow your nose to the Lili Bermuda Perfumery for a free tour and sample their exclusive perfumes. They manufacture and bottle all of their own scents using more than 3,000 essential oils. I brought home a bottle for myself and my mother. Next follow your stomach to Bailey’s Ice Cream parlor for a cone of their homemade all-natural ice cream. Meander through King’s Square where you will find people in colonial costumes performing reenactments of historical events. While you are in the Eastern Parish, visit the top attraction on the island. In 1907, two young boys were playing outside when their ball went down a hole. Instead of considering it a loss, they ran home for rope and climbed down after it to discover a limestone cave and a subterranean lake. 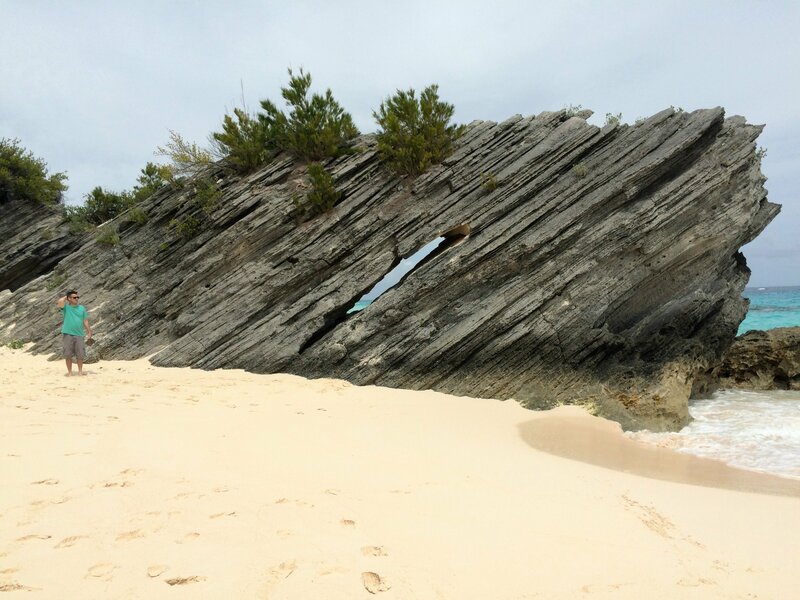 If you are in search turquoise water and Bermuda’s trademark pink sand, head to Horseshoe Beach. This crescent shaped beach is about as idyllic as it gets. Explore the many caves and rock formations that surround the area. This was my favorite activity. We got up really early for a sunrise ride on the beach. It was a great way to see the island and get my animal fix. I rode this rescued horse that ambled along slowly and stopped for a lot of snacks… but when we reached the ocean, she really came to life. She walked straight into the water and started kicking and splashing. Our riding instructor told me I could make her stop, but how could I? She was having so much fun. We were headed straight to the airport from the stables, so I flew home with some salty wet pants, but it was totally worth it. This tour comes highly rated. 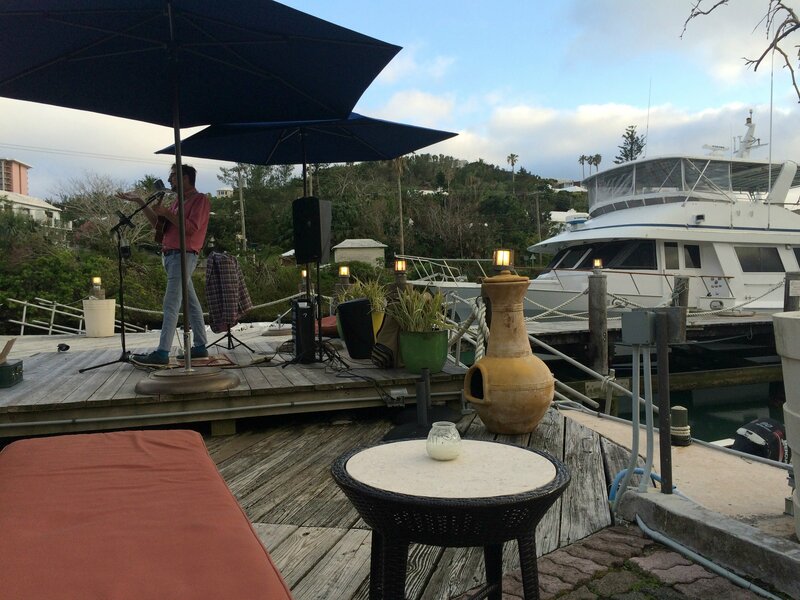 We found Mike playing at The Dock at the Water Lot, which is a waterside lounge. We arrived early for our dinner reservation and sat by the harbor. He was playing the ukulele, singing and making us all laugh while we had a drink. He was so talented and entertaining. Look up his schedule. Wherever he is playing, go find him. Trust me, it was a real highlight of our trip. In fact, I was actually disappointed when they called us in to eat. 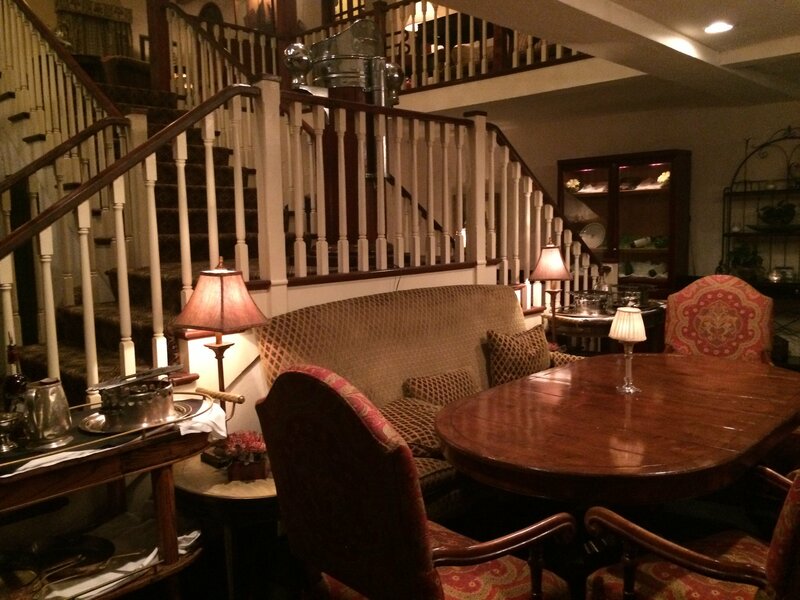 This is an amazing restaurant and was a big splurge for us. Hint: when they use one of those little thingies that swipes the crumbs off your table, it’s going to be expensive. It was worth it though. We were celebrating our 5 year wedding anniversary and first trip without kids, so we deserved to treat ourselves. It is a steak house, but they offer a vegan menu so there is something for everyone. The capital city is a nice place to walk around if you want to do some shopping. 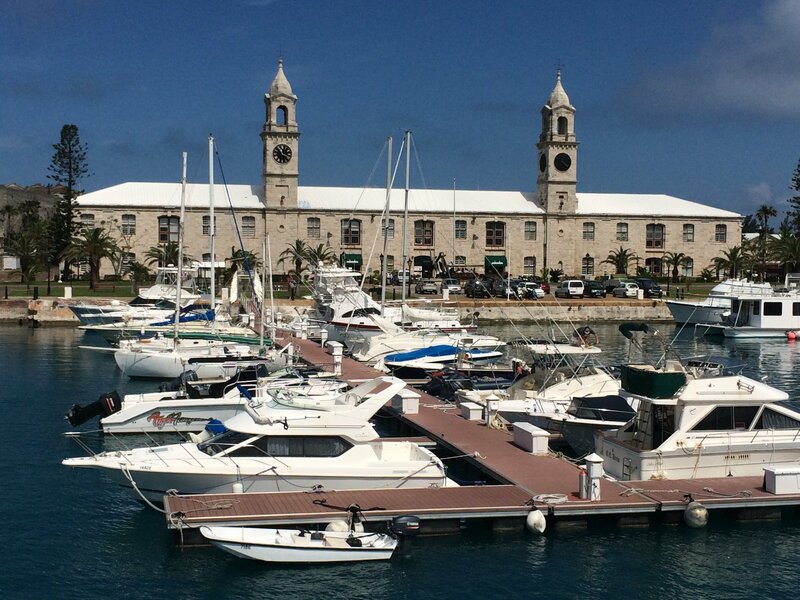 We came to Bermuda to get away from the hustle and bustle, so didn’t spend much time here. Don’t miss Alexandra Mosher studio. She makes the most amazing jewelry using pink Bermuda sand. I bought a keepsake necklace with my kids initials that will always remind me of my time there. Climb the 185-step spiral staircase of the Gibbs Hill Lighthouse to enjoy one of the best views on the island. From the top, you can see the Royal Naval Dockyard and across the water to the city of Hamilton. Admission is $2.50. This was another beautiful place to have a meal. Elbow Beach is picture perfect. We watched the sunset over dinner and then sat out on their terrace which was lit by torches. As the sun went down and it became chilly, they walked around and handed out blankets. I was not impressed with the Dockyard. This is where the cruise ships dock and unload so it is crowded and touristy. The shops are overpriced tourist traps and worst of all, they stuck dolphins in a small swimming pool as an attraction. You can pay upwards of $600 to interact and even kiss a dolphin. Keeping animals confined for our entertainment is pure cruelty, especially when those animals travel up to 40 miles a day in the wild. People who have taken part say that it was sad, depressing and a total rip off. We were only there for a long weekend and will definitely be back. I wish we had time to check out the railway trail, which is an 18 mile scenic trail that goes from one end of the island to the other. Tom Moore’s Jungle looks like a great place to hike around as well as Spittal Pond Nature Reserve. 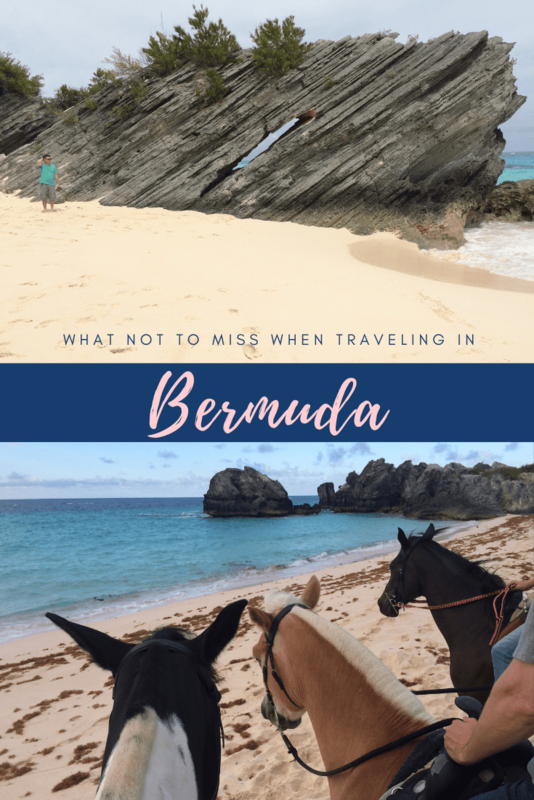 Have you been to Bermuda? What was your favorite part? Let me know in the comments below.